Reflecting back on Remembrance weekend, what struck me was a real sense of community throughout the commemorations, whether it was the parade of 10,000 people past the Cenotaph in Whitehall, each carrying a photo of someone dear to them who had given their life, people gathering together to watch the faces of soldiers on beaches, or indeed at our local parade which was attended by many more people than in the last few years. This sense of community was certainly prevalent at the two events I attended over the weekend to help unveil Centenary Fields plaques. Two more green spaces that are now protected with Fields in Trust for future generations to enjoy. The first, in Oakham, Rutland was in a playing field renamed as Rutland Remembers that was once part of the Rutland Agricultural Society. The Society's secretary, Mr George Gibson served in the Rutland Volunteer Regiment during World War I and his eldest son, Corporal John Gibson, was killed in action in 1916. His story had been researched and an interpretation board installed to ensure that his memory will live on. Guides and Brownies helped to unveil the plaque, and there was poppy planting, a blessing of the field by the local Reverend, cake and hot chocolate! Many local people came along, as well as the High Sheriff and the Lord Lieutenant. 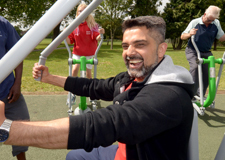 The second event, in Willenhall in Walsall took place in a beautiful park that was actually built by returning soldiers after World War I. A production of A Soldier's Tale, the story of the pre-war and wartime experiences of one of the soldiers, culminating in the opening of the park, plus a choir singing songs from the period playing of the Last Post and a roll-call of soldiers from Willenhall who died in the conflict, made for a very moving experience. 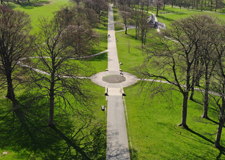 At Fields in Trust we passionately believe that parks and green spaces can be valuable hubs for local communities, and the Government's recently published Loneliness Strategy identifies that they recognise "the value of public parks and green spaces, helping them bring together communities now and in the future". This is certainly true in Oakham and at Willenhall Memorial Park, the latter having a dedicated 'Friends of' group that organise events throughout the year in the Park, and which is celebrating its 25-year anniversary this year. The Centenary Fields Programme, delivered in partnership with The Royal British Legion, has protected more than 150 valuable parks and green spaces so far and many more are in progress. To discover the stories of some of those already protected, do explore the Centenary Fields Legacy interactive map. Protecting memorial parks and green spaces with Fields in Trust will ensure they are not lost and that they become part of the valuable legacy we are creating from the World War I commemorations. 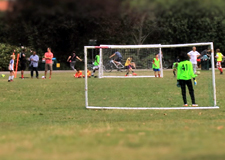 We are calling on local authorities that have not yet been part of the Centenary Fields programme to join before it closes at the end of the year and save these precious green spaces. When the programme concludes, there will be a network of parks and green spaces across the UK which are protected forever so that people will always have somewhere to run, play, have a picnic or just take a moment to reflect on the sacrifice made by the World War I generation, to whom we owe so much. I think that's something that the brave soldiers who built Willenhall Memorial Park 100 years ago, would have approved of. 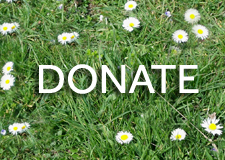 And if you would like to help us continue our work to protect valuable parks and green spaces, do please consider a small donation. As a comparison, a donation of £3 would have covered the cost of a month's worth of tea for an army battalion at 1918 prices - please text CFLF18 £3 to 70070 to donate to Fields in Trust and make a difference today. Angela Lewis is Fields in Trust Head of Programmes and Development Manager for Central England. She can be contacted by any of the below means. Angela Lewis is Fields in Trust's Head of Programmes and has a Development Manager role covering the East and West Midlands, Gloucestershire and Wiltshire. She joined Fields in Trust in 2011 with a focus on the QEII Fields Challenge and now leads the organisation’s work on the Centenary Fields programme. 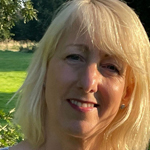 Angela has always worked in sport and leisure for a variety of organisations at national, regional and local level including Sport England and London Borough of Richmond.